Early Start French 1 - 02 Ça va? In the video - or on the CD-ROM - you will see lots of people - children, adults and giants - meet up and ask "How are you?" If you make a puppet, you will always have someone to talk with in French! Here's how to make a puppet that can only speak and understand French. You can make a simple finger puppet with paper or felt; glove puppets can be made starting with a large old sock, a glove, or an old cuddly toy with the stuffing removed. 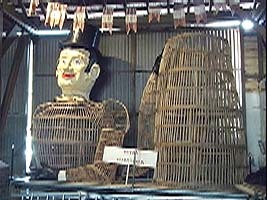 The "giants" of North France are a recurring theme in the video, appearing in every title sequence and in many of the sections. They are a living and popular tradition, with new giants being created every year. The custom has strong roots in religious festivals and in folk lore and traditional tales and legends. the two giants of the small hilltop town of Cassel, "Reuze Papa" and his "wife", "Reuze Maman"
The framework that goes underneath the giant "Tutor"
- pulling it along on a trolley. Giants used to be made of wickerwork, with a papier-maché head. Today all sorts of lightweight but strong modern materials are used, such as aluminium mesh and polystyrene. These may also be easier for children to work with. Revise what you have learned in sections 1 to 3 on the Primary French web site, which follows the same official Guidelines as Early Start French. Go to 'Hello! How are you?' and see how much you know!.